For Pagans and Christians alike, Jesus Through Pagan Eyes offers a provocative portrait ofJesus--as a compassionate, life-affirming, nature-inspired spiritual teacher, freed from the limiting ideology of the Church. Rev. Mark Townsend sets the stage by exploring the historical evidence of who Jesus was as a human being before delving into the realm of metaphor and mythology, the notion of Christ, and the Church's conception of Jesus as Christ. The heart of this unique book lies in the thoughtful and deeply moving collection of stories, essays, and interviews about Jesus from today's most respected Pagan, Wiccan, and Druidic leaders. Contributors such as Maxine Sanders, Christopher Penczak, Janet Farrar, Diana Paxson, Philip Carr-Gomm, Oberon Zell-Ravenheart, John Michael Greer, Selena Fox, and Raven Grimassi explore the historical figure of Jesus in relation to Witchcraft, the tarot, goddess worship, and shamanism--while illustrating how this god of the Christian church blesses and inspires those who embrace non-traditional spiritual paths. 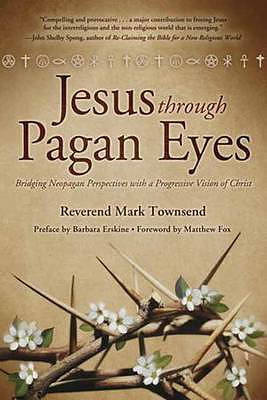 Jesus Through Pagan Eyes: Bridging Neopagan Perspectives with a Progressive Vision of Christ by Fox, Matthew was published by Llewellyn Publications in June 2012 and is our 13149th best seller. The ISBN for Jesus Through Pagan Eyes: Bridging Neopagan Perspectives with a Progressive Vision of Christ is 9780738721910. Be the first to review Jesus Through Pagan Eyes: Bridging Neopagan Perspectives with a Progressive Vision of Christ! Got a question? No problem! Just click here to ask us about Jesus Through Pagan Eyes: Bridging Neopagan Perspectives with a Progressive Vision of Christ.